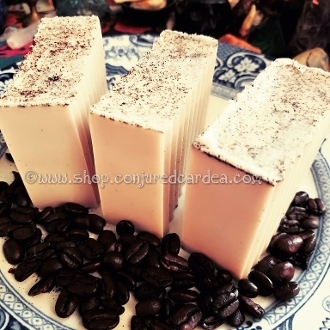 "Coffee Conjure" soap. Coffee has long been used in hoodoo and folk magic practices to add speed and success to workings. It's also incredibly good for your skin by providing revitalizing and exfoliation. My soap is created with Cafe du Monde coffee which also features chicory root in its blend. Chicory root works to literally ground and root our intentions in our work. Rich coffee scent with a touch of tonka bean. Listing is for one, 6 ounce bar.